After moving into our new apartment, it felt like there was just too much to do when it came to decorating, especially the dining room. Do I add a cool light fixture to brighten it up? See what I did there? Do I buy some funky new chairs to go with my dining table or add some color to the walls? Well, I soon discovered there are lots of ways to transform the space and make it my own, just by adding fun elements. And you can do the same. 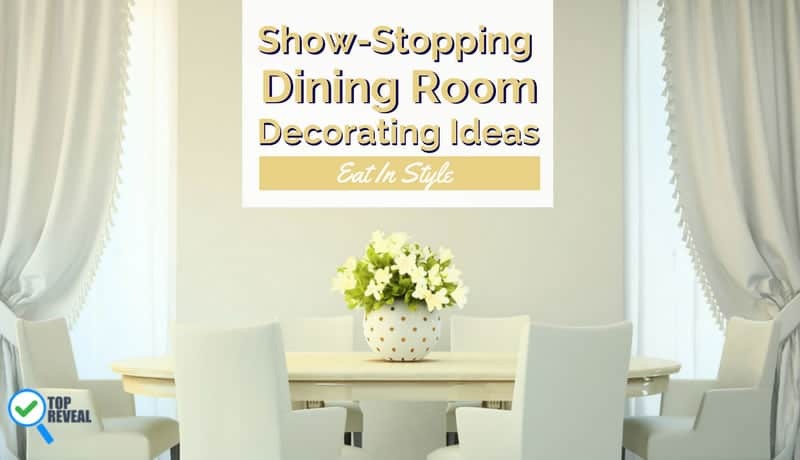 With a little work and my list you can make your own beautiful dining area with these show-stopping dining room decor ideas. 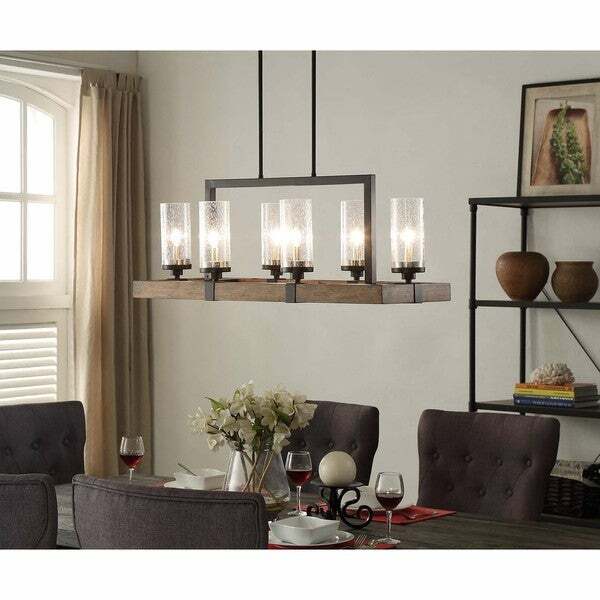 One of the easiest ways to give yur dining space some character is by adding an eye-catching fixture to hang over your table. Not only will it illuminate the room but when you choose a style like the one above it gives off a dramatic flair that quietly conveys an air of class. Make your dining room a show-stopping centerpiece to your home just by adding some pretty chairs. Choose seating with unique detailing, like across the tops of the chairs in the picture for a custom look that doesn’t cost a fortune. Blogger Christine Andrews dining room stands out for several reasons, the biggest being the pictures she has on her accent wall. By framing a bunch of pictures and grouping them together on a feature wall you can give the dining room a fresh look without even changing the decor. Click here to see this design, courtesy of Andrea Schumacher Interiors. Create an eye-catching design by incorporating splashes of colors that are tied together with a theme or shade. 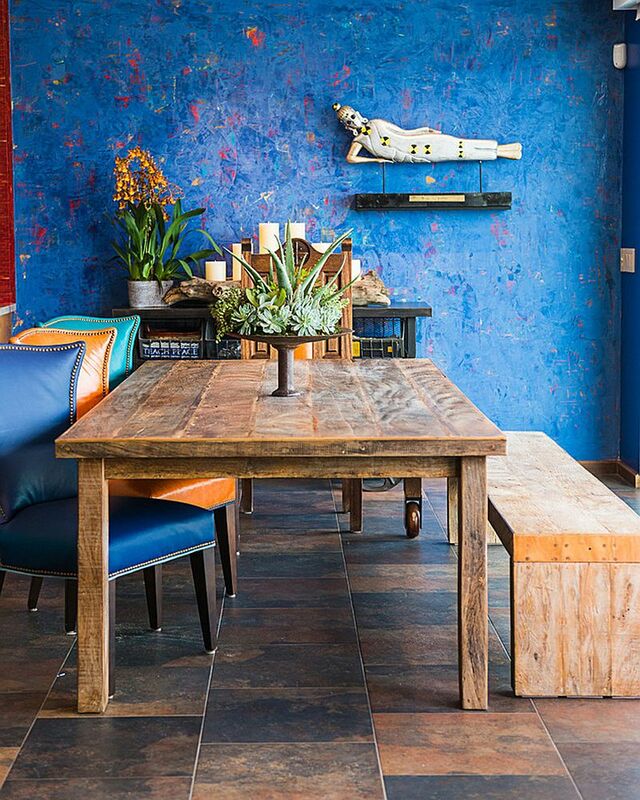 Using colors that play well off of each other can instantly update the space. 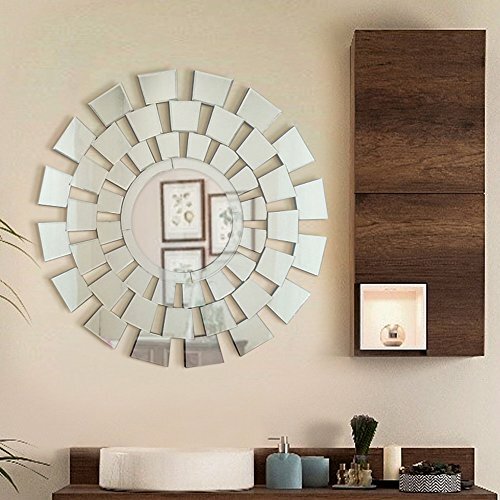 You want family and friends to not just dine, but enjoy the ambiance and this mirror will definitely set the perfect mood for your next dinner party. It makes a great icebreaker for guests when they mingle and is great if you want a more upscale feel. Painting your walls lets you design around it. Going for something that’s predominantly cold with hints of warm colors underneath really makes the rest of the room pop when you use warm colored accents and accessories. Go here to see this design. Using a marble top for your dining table adds a luxurious and sublime look to the room and creates a point of interest for everyone to ooh and ah over. It’s a great investment piece that you can pair with all types of decor too! See Deisy Dee Stretch Chair Cover for your Dining Chairs. 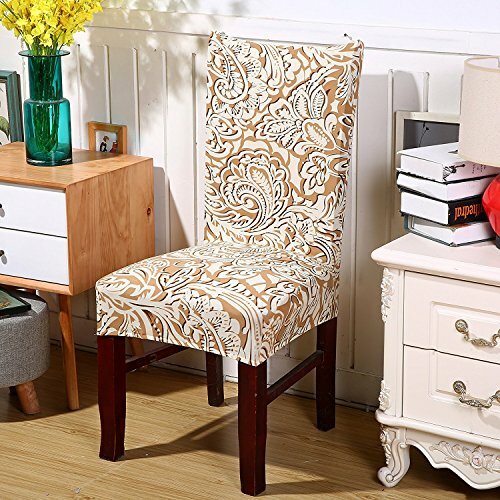 Even old chairs can look new with a stylish slipcover. The great thing about these is they come in thousands of colors and patterns, so you can change the look of your dining area to match the season or occasion. 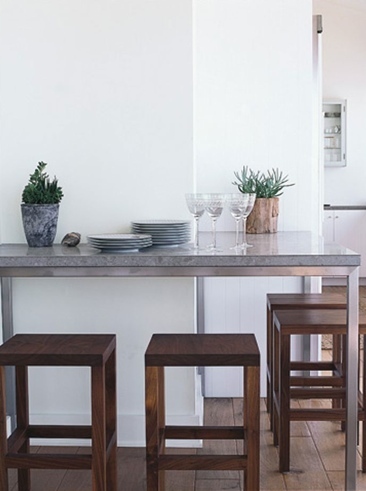 Designer Nate Berkus designed this Malibu beach house with the intention to create long-lasting memories for the family. For dining, Nate built the table into the wall, making use of the corner to save on space as the stools can go under while also making for a more relaxed feel. Use a pedestal table to go for a more modern, chic look. This looks really great when also paired with muted walls that are complemented with touches of whites and colorful and expressive art lining the walls. Using Banquettes for your seating needs lets you add some space saving décor to your overall design. While looking stylish, you can also style it to match the colors you’ve already set up around it. Like repeating the dominant hue that’s happening in the backdrop. Creator of The Chriselle Factor, Chriselle Lim and designer Lucinda Pace of Laurel & Wolf wanted to turn their Los Angeles home into something chic and modern. By using a brass chandelier and lighter shade for the table, they were able to design through those elements, using brass accents for the cabinet handles and black for the chairs and office space. Create a show-stopping dining room look by weaving similar tones throughout the room. Different shades of blue create a harmonious setting, and with light streaming in through the side windows, the metal hardware of the pedestal table will reflect all of those hues around the room. See how to outfit your home with Ideal Homes. Designer Nate Berkus in collaboration with architect Ahmad Sardar-Afkhami created this Greenwich Village townhouse. The décor of the dining room mixing vintage and classic pieces with a crème and chocolate color scheme give it a decadent feel. Turn your existing lighting into a piece of art that draws your guests in. 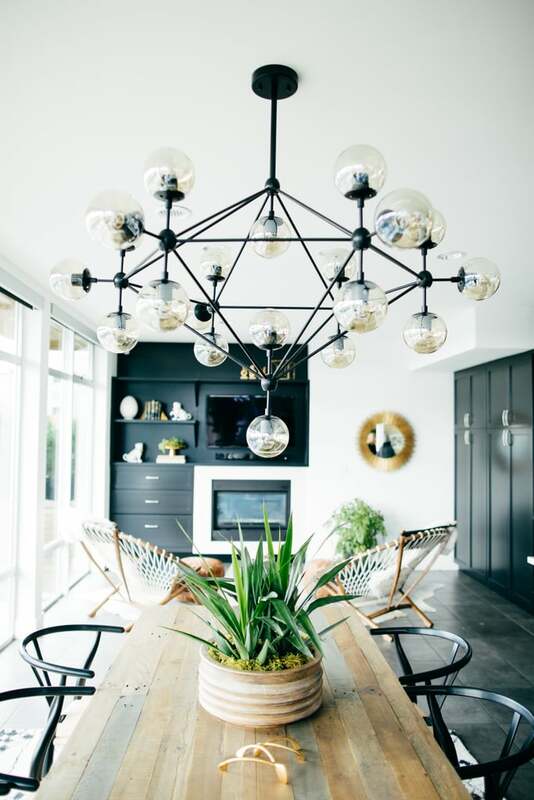 Using an industrial mobile chandelier with vintage bulbs can be an easy piece to change that can drastically improve the look of the dining room. 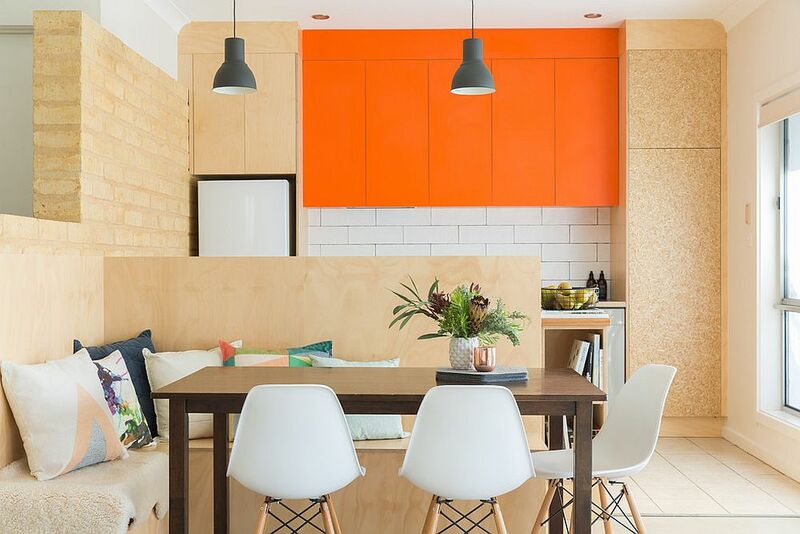 Home designers, Pop & Scott, made up of husband and wife duo Poppy Lane and Scott Gibson created wide, open spaces in their Australian home. The dining space sits next to a large stretch of windows, opening things up. 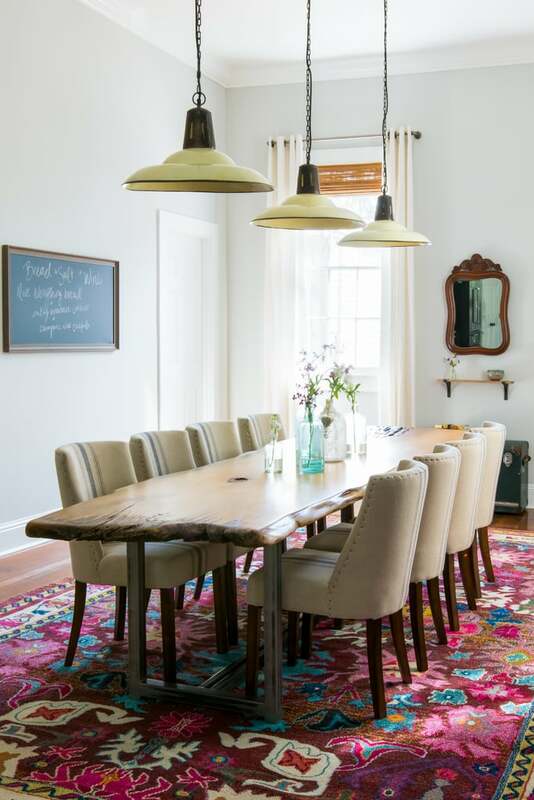 And because there aren’t walls separating the dining area from the rest of the house, the duo was able to keep the same design aesthetic they have throughout and apply it to their dining layout, with the casual chairs and playful round table. Artistic Designs for Living turned this Tahoe residence into a relaxing dining space. 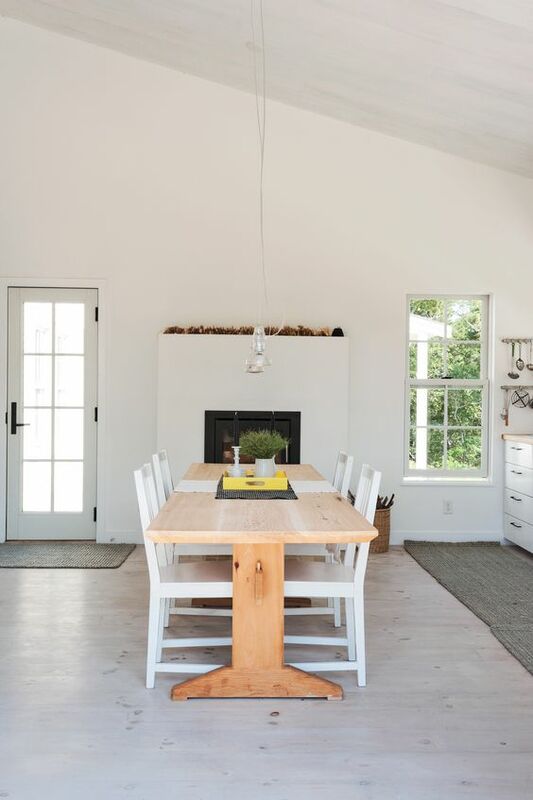 The use of ample lighting that’s soft throughout the home and surrounds the dining furniture helps brighten and soften the wood and dark accents of the bench. Cream colored candles as the table’s centerpiece help offer a balance that ties the room together. 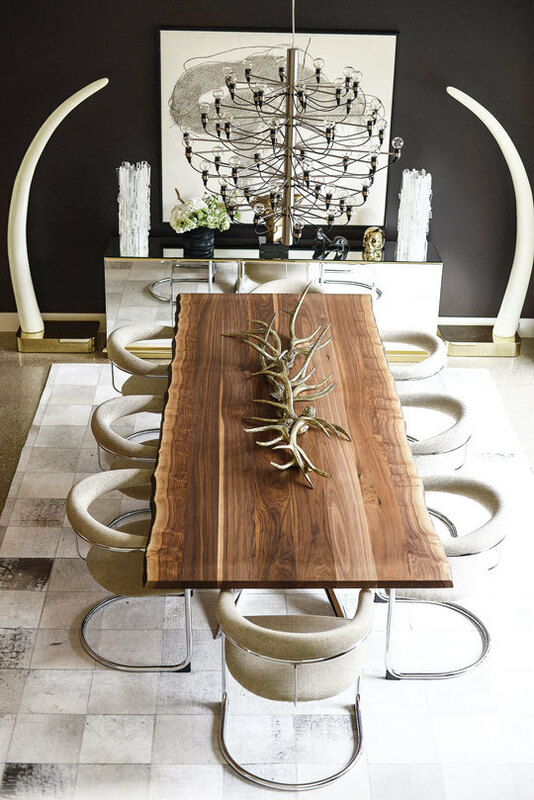 One of the show-stopping pieces in interior designer’s Clair Parker Tompkins home is a live-edge dining table. A beautiful piece that’s surrounded by contrasting black and white décor. The rustic and rough appearance of the table is playfully balanced with sleek, modern chairs and styling with an art backdrop. Design firm Hacin + Associates renovated a 1932 Tudor home into a modern dwelling, without sacrificing the vintage element. 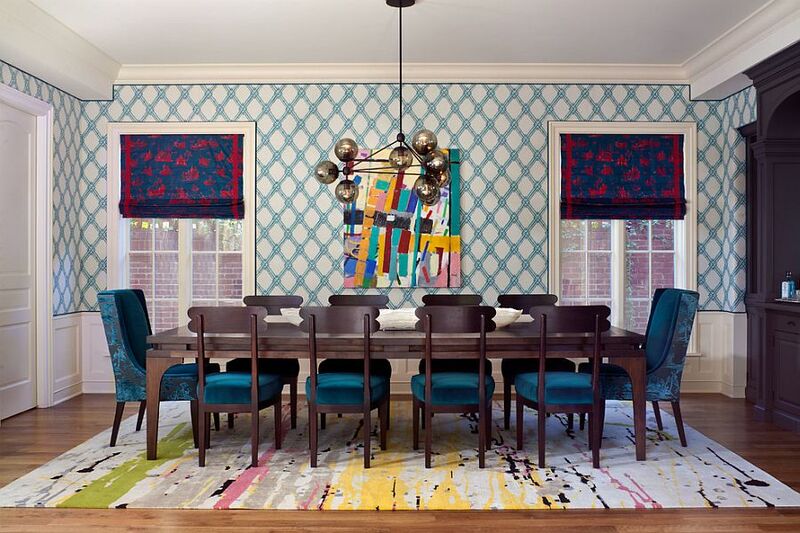 The dining room’s simple aesthetic has added to it playful splashes like the ceiling paper. 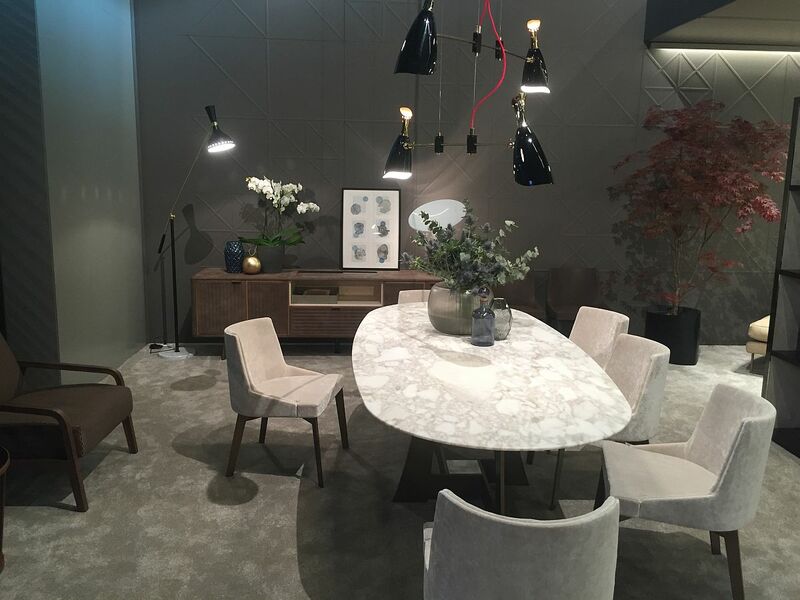 Because the room is so square, they also added a Poliform “Flute” pedestal table and complimented it with a round lighting fixture. Making the entire room, serious and playful. Click here for this design. Using a series of hanging bulbs that match the color of the walls allows the room to have an attitude while not looking out of place by tying it to other elements. 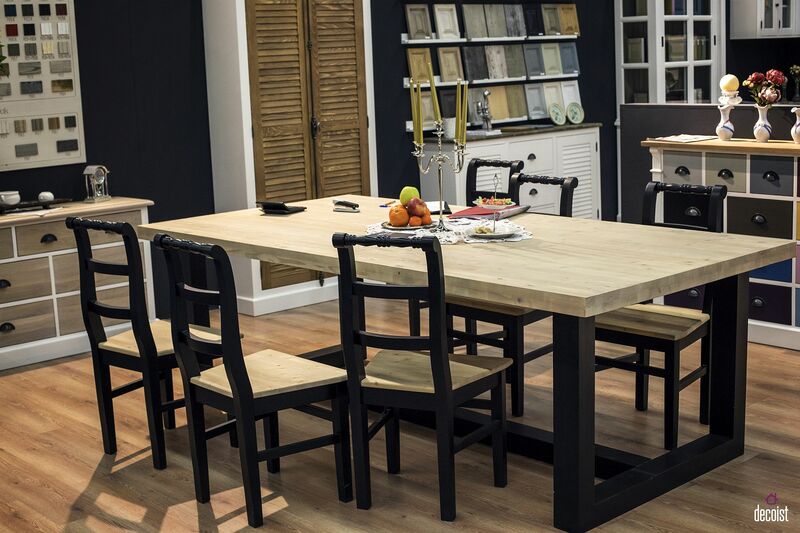 Mixing the materials of your table and chairs can be one way for you to blend different design elements. 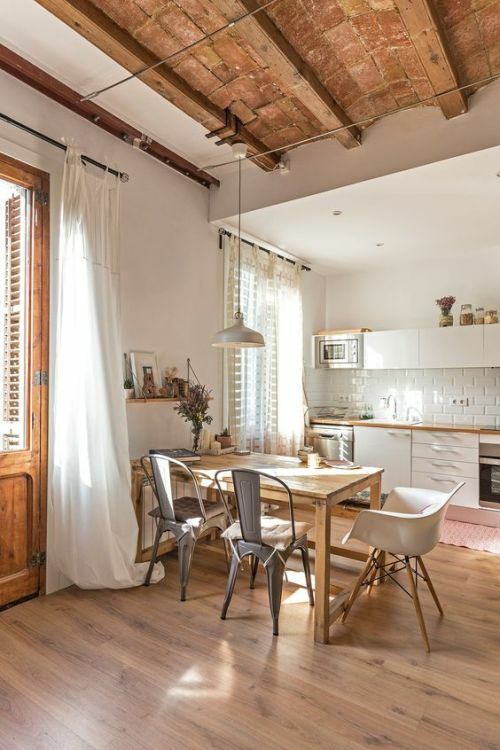 Like being rustic and traditional while still keep your space modern. Click here to see this design and others. If there’s one particular color that you just love, build your room around that hue. Using complementary colors and whites to keep it balanced with planters and a nearby window. After starting out from zero trying to design my own dining room, it was invaluable being able to look at the other great work people have done with their rooms, to get those creative juices flowing and feel inspired. If you enjoyed this list, have your own ideas or just want to say hey, leave your thoughts in the comments. Remember to share with someone else you know who just can’t seem to get the right look with their dining room.